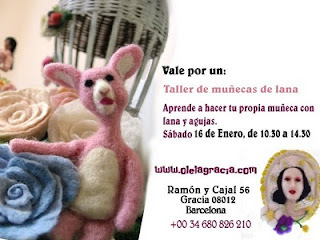 Do you want to create your own neddle felted doll? I will run the workshop in Oslo on 16th January. The class starts at 10.30 till 14.30. It will cost 40€ which include all material and refreshment. Don't miss this opportunity!!! ***Si quieres regalar este taller ahora puedes: échale un ojo al vale ***if you want to make a gift, you can now: have a look to the gift voucher.